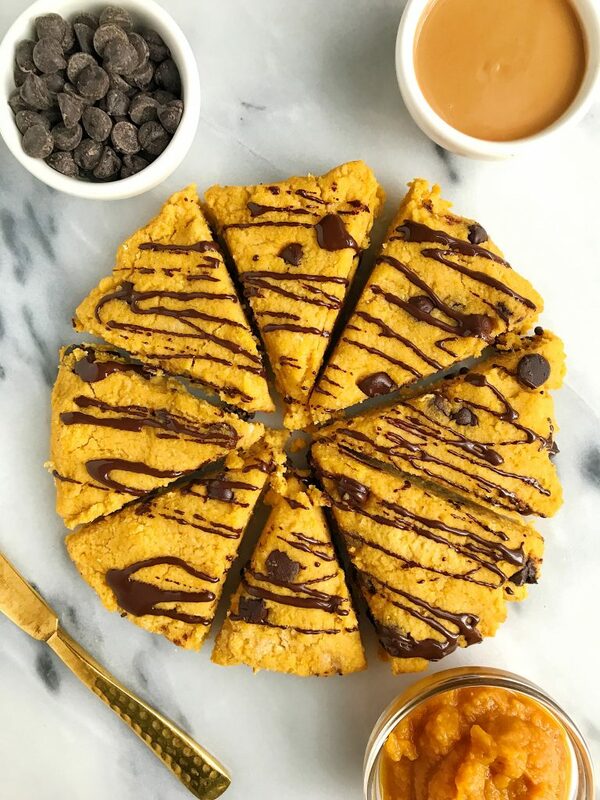 Paleo Chocolate Chip Sweet Potato Scones made with almond + coconut flour for an easy healthy scone! 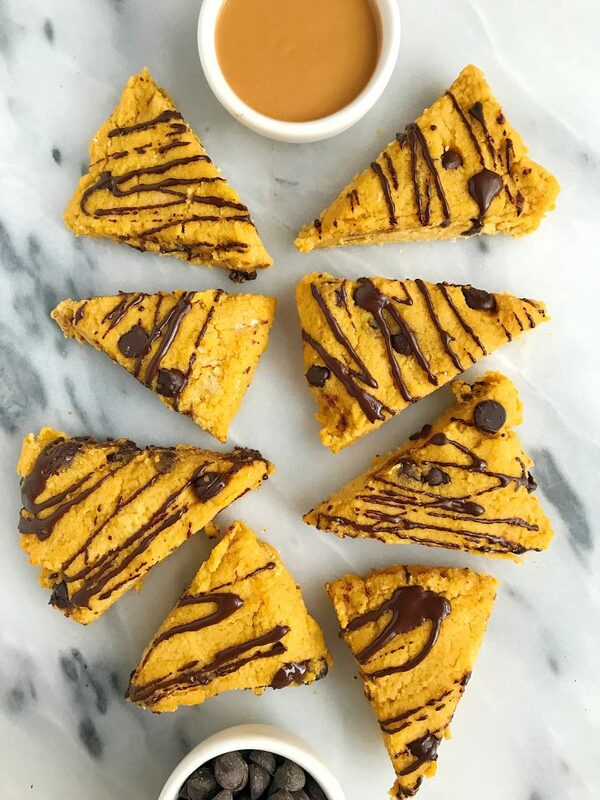 Paleo Chocolate Chip Sweet Potato Scones are HERE. The first sweet recipe of 2018 is ready for you guys. In case you are relatively new around here, I am all about creating recipes that are made with real ingredients. I don’t want anyone to sacrifice flavor for health or think that they can’t eat a baked good because it’s not “healthy”. We can have our cake and eat it too and not feel guilty about it. I’m not into juicing or depriving and I definitely am not living my life without my baked goods. I use ingredients like almond and coconut flour, avocado oil, sprouted oats and more in my recipes. You won’t find much refined sugar or regular flour or even dairy-based milk around here. I love finding new products to add to my daily eats and drinks that also make me feel good. Like Vital Proteins! I love that I am adding protein to my food and drinks and by using collagen, I am also adding an extra boost for my hair, skin and nails. It also helps with digestion, joint health and more. 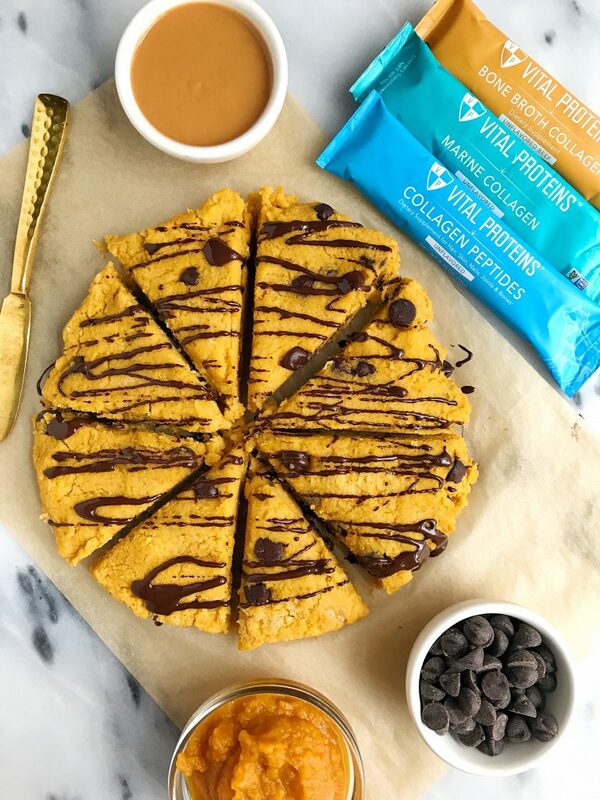 These Paleo Chocolate Chip Sweet Potato Scones are a delicious recipe using collagen peptides. Once you are done baking and enjoying these, I also have a handful of more recipes on the blog featuring collagen peptides! These scones are low in sugar and in fact have no added sugar besides the chocolate chips! Bake in oven for 25 minutes and enjoy! Hi Rachel! Might be a silly question – but can you just use regular sweet potatoes instead of the puree? I am looking to make some sweet potato skins for the SuperBowl and am thinking of ways to use all the sweet potato insides and thought of this recipe! it should work! but add them to food processor so they turn into puree. Can I omit the collagen peptides if I don’t have them on hand? sure just add more flour! Hey Rachel! Do you think these would freeze well? I’m planning to make these but don’t think I could eat them all in time!